Black’s Regal, Sunderland opened on 28 March 1932 with J Arnold Eagle at the console of the Compton organ. Arnold Eagle remained at the Regal (he was also Musical Director for the company) until 1946 and, during his stay, lessons were arranged for a young man who became assistant organist from 1938 – 1940 before moving on to greater things with ABC. This young man was Stanley Wyllie, latterly of Ritz Belfast fame. During Eagle’s tenure there were a series of ‘house’ organists to fill in when his other duties called him away from the organ. The Compton was little used post war and in 1976 restoration began by the newly formed ‘Sunderland Odeon Organ Society’. By 1980 regular concerts were being presented. This state was short lived, however, when the Odeon closed in 1982 and the building was stripped of its fixtures and fittings. 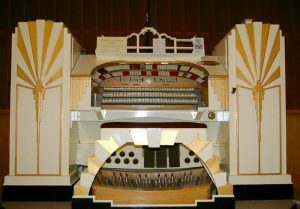 The organ was sold to the ‘Sunderland Theatre Organ Preservation Society’ for installation in Ryhope Community Centre. The organ was officially ‘switched on’ by the Mayor on 28 March 1992, exactly 60 years from the original opening date.